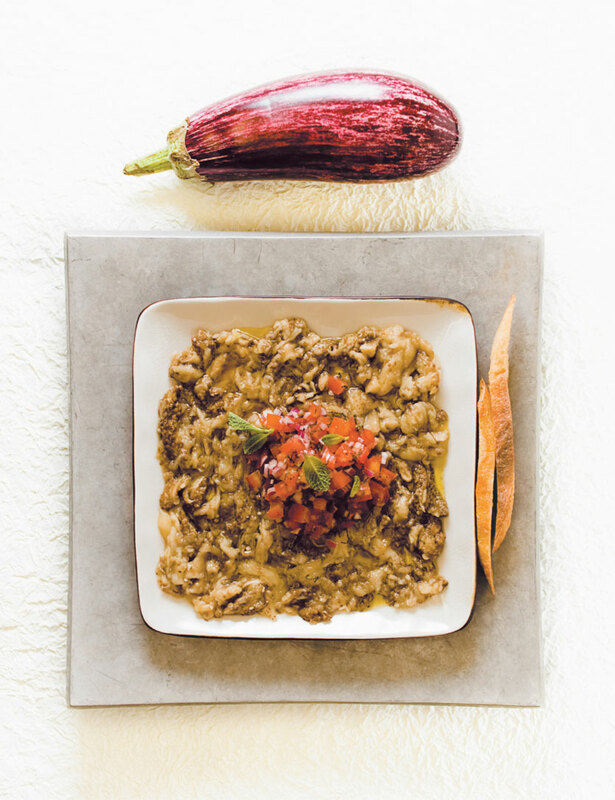 — Using a fork, prick eggplant on all sides and place it on a baking sheet. Bake for approximately 50 minutes or until tender. Cool and cut the eggplant lengthwise. With a spoon, remove the flesh and chop it coarsely. In a bowl, combine eggplant, garlic and olive oil, season generously, and place on a nice serving dish. FINALE — Mix together the tomato, onion and mint, and sprinkle on the eggplant. Drizzle with olive oil and enjoy. TRICK — Delicious with crostinis, pita breads, or as a side dish with lamb chops or grilled fish. NOTE — Another way to enjoy eggplant is to season it with mint. Its fresh flavor will amaze you.